BARDIYA, March 28: Until 19 years ago, indigenous people of Nangapur village in Bardiya district were bonded laborers known as Kamaiyas, who worked as slaves for wealthy landlords. They were eventually liberated from the vicious cycle of oppressive practice by the government and thereafter began their difficult rehabilitation in an estranged society. But now, they are facing yet another battle in the form of a relentless fury of floods, which have been wreaking havoc in the area in recent years. One of the freed bonded laborers Seema Tharu is living on the brink of poverty. The 37-year-old freed Kamaiya does not own any land for farming. Her husband works as a daily wage laborer in Nepal’s capital, Kathmandu, while she is a construction worker at a nearby embankment construction site. “Along with the losses from floods and inundation, we have also spent considerable resources dealing with their aftermath,” said the mother of two. Even their combined income is not sufficient to keep their small family afloat. Another local, Purnima Chaudhary, 35, is living hand-to-mouth, but the recurring floods and inundations have made her even more miserable. Five years ago, floods from the nearby Karnali River completely annihilated her crops that were supposed to feed them throughout the year. Her already struggling family faced insurmountable economic hardship that year. Food insecurity and poverty are common problems throughout the village in Rajapur-5 and surrounding settlements. The situation has been worsened by the changing weather patterns due to climate change, which have undeniable and profound impacts on agriculture and livelihood. “It rains unexpectedly and that too when we don’t need it,” said Chaudhary. She says erratic rainfalls are becoming more common in her area of late, increasing the risks of great floods. Such a pattern is pushing the already impoverished communities toward further destitution as resulting floods destroy their crops and property, and even threaten the lives of the locals. But the residents of Nangapur, which comprises chiefly the freed bonded laborers, are not backing down without a fight. Although they can do nothing to stop the unprecedented impacts of climate change, they have united in mitigating its impact at least. In 2015, the village formed an institutional mechanism of community disaster management committee (CDMC) by incorporating members from different households as a proactive measure to decrease the devastating impacts of such floods. Under its leadership, various task forces were formed with specific responsibilities carried out in a coordinated manner. The Women’s Task Force, with 10 members, is responsible for mobilizing the women as a part of preparedness against such disasters. They hold discussions among women’s groups and lead different actions in coordination with the local bodies and stakeholders. Their involvement is considered as key to building community resilience as most men in the village migrate for employment opportunities. Also established are Early Warning Task Force, Search and Rescue Task Force and Primary Treatment Task Force, each having five members with appropriate training who spring into action accordingly. Under the Early Warning System Project initiated by an NGO, Practical Action, such committees are formed at several villages living in catchment areas of big rivers including Karnali, Babai, Rapti, Seti, Koshi, Kankai and Kamala at various points of time. As soon as the water in those rivers reaches the danger level, vulnerable villages are alerted through mass SMS and various institutional mechanisms. The early warning system gives at least 2-3 hours lead time before flood arrives at villages in the catchment areas. The CDMC’s resolve was tested recently during the massive floods of August 2017 that killed 169 people and caused damages to over 650,000 houses along the country’s southern plains, according to estimates of the Ministry of Home Affairs. Rabina Devi, one of the members of the Rescue Task Force in Nangapur, says that all the households were ready to flee when they received the first SMS alert. “As we already anticipated the floods, we transferred our crops and livestock to a safer location and kept our important documents in an emergency bag by the door,” she said. According to her, community task forces alerted every household by activating a siren, which covers 1.5 kilometers, and led the evacuation process. “We helped children, pregnant women and people with disabilities to get to a safer location. By the time floods reached here, most of us were already in safe locations with our movable valuables safe as well,” added Devi. While some moved to their relatives’ houses, others took refuge at a community flood shelter, a two-story house built on higher ground in the village for the same purpose. The village incurred losses but they said the devastations would have been much worse without community resilience efforts. Timely alerts from the early warning system, community preparedness and response capabilities of the village’s CDMC helped save much of the farm produce and livestock. While such efforts have helped minimize yearly causalities, experts feel that there is still a long way to go in terms of risk preparedness. After all, government records show that floods claimed 4,344 lives across the country from 1971 to 2015. Likewise, yearly human causalities from floods since 2015 are consistently between 100 and 200 deaths. Gehendra Gurung, an expert of disaster risk reduction with 14 years of experience in the sector, said risk management has not been as effective because the stakeholders have failed to relocate poor people and squatter communities from vulnerable areas. 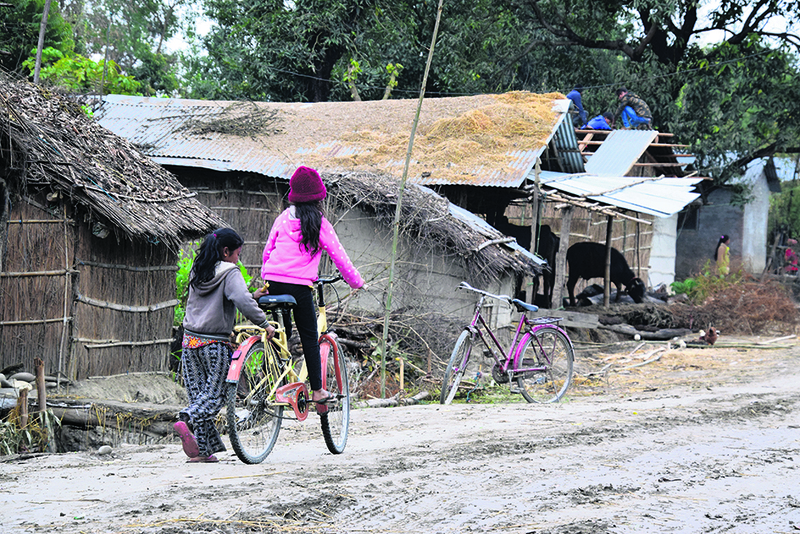 “Not only do they lack resources for relocation, but their livelihoods are also centered around the existing risky area, making relocation a difficult choice for them,” said Gurung. He stressed on the need to find a solution to the relocation problem to truly reduce the yearly devastations.